Yesterday was Mrs. NH’s birthday. I’m not much of a baker so I always hate baking cakes or something for her birthday. I always end up looking like some jerk out of a sitcom with flour all over my shirt and face. Well, the same thing happened this year (thanks to Little NH2 TURNING THE MIXER UP TO 5) but the end product was much better than the crappy cakes out of a box that I usually make. It is called “Skillet Chocolate Chip Cookie” and man, is it tasty. We doubled the chocolate chips in the recipe and my blood sugar still hasn’t regulated but what a terrific way to die. (It’s a chocolate mess with double the chips. But Mrs. NH apparently likes it this way so it’s all good.) It’s also really simple. No plopping cookies on the sheet and waiting around. Just throw the dough in the pan, toss it in the oven, crack a beer and prepare to be a hero. It also pairs really well with bourbon. Natch. I think I’ll do it again substituting chocolate chips for chili pepper infused dark chocolate and then sprinkle the top with sea salt. Cross your fingers that you get an invite to that dinner party! This weekend, with one confirmed case of strep in the house and everybody generally worn out from a big week, I made some family comfort food. Thai Basil Pork is supposedly Thai street food. I’ve never been to Thailand so all I know is, it’s absolutely delicious. Mrs. NH recommended that instead of pairing it with rice or rice noodles, we whip up some carrot “zoodles” instead. What we got was an absolutely flavorful dish that scratches an Asian food itch while seeming sorta healthy. I tweak the recipe a bit each time. This time, we couldn’t find “Golden Mountain Sauce” so I just added more lime and oyster sauce. I also tend to add two eggs to the mix, partially to bulk it up some because of my ravenous family and partially just because I love the eggs in there. Fresh lime is key in this recipe. It takes a bit of time to make with all of the prep work but once you’re done it is worth the effort. Now comes the fight for the leftovers. Me: Hey, how’d you sleep? Mrs. NH: Oh, crud. You forgot to season the brisket. Me: Crap. You handle the girls’ breakfast and I’ll do it now. You see, we take our brisket pretty seriously in the NH household. It’s a rare, expensive delicacy in the Czech Republic. It’s even more special when it’s accompanied by homemade creamed sweet corn – flash frozen in the waning days of the summer. To top it off, Mrs. NH “invented” her own SaSo seasoned sweet potatoes the last time we had this and I could have eaten the whole damn batch. Twice. We’ll freeze some of this batch of meat for barbacoa tacos to be enjoyed on some crappy-weather January Sunday. It lightens my mood just thinking about it. It has been two days full of cooking around the NH homestead this weekend. I’ve made and frozen several pounds of crock pot carnitas and crock pot chicken tacos for the return of the NH girls. I’m also getting ready to whip into meatloaf gravy to be used as pasta sauce and a batch or two of pizza crusts for the freezer to boot. 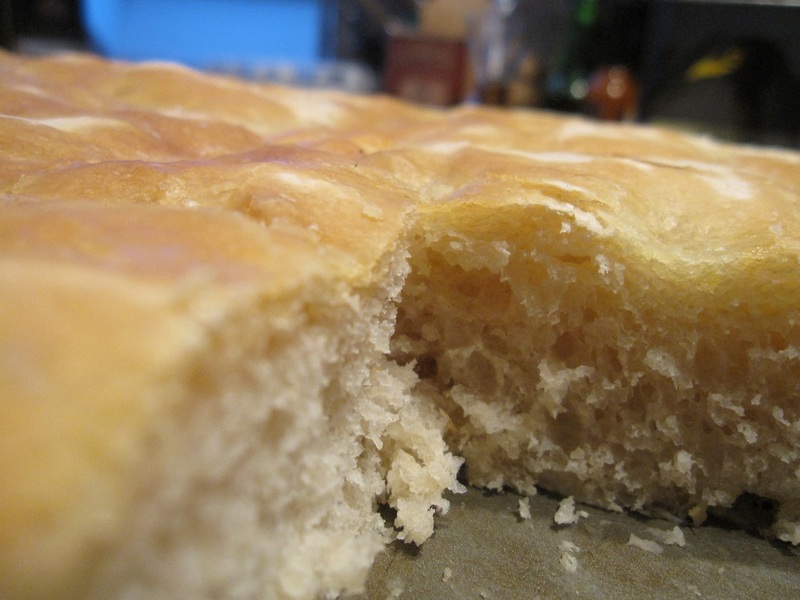 I’ve also tackled a bread recipe that I’ve always wanted to make – focaccia. My fondest memory of focaccia is from Monterosso, Italy. After spending the day on the beach in Monterosso, we stopped in a bakery for a Peroni and wedge of focaccia to take on the boat ride back to the little village of Vernazza. I just remember that bread being some of the most simple and flavorful that I had ever tasted. Moist with olive oil and each bite held a little crunch from the generous sprinkling of sea salt on top. Bolstered by the Peroni and post-beach euphoria, that bread is the pinnacle of flatbreads in my mind. The recipe I used was from the always reliable “Crepes of Wrath” and was very simple. If you’re interested in trying it yourself, I would only offer a few observations. I did mine in my stand mixer and couldn’t imagine doing it any other way. After adding all of the recommended flour, it still seemed to thin so I added about a 1/2 cup more. That did the trick. Also, in the final step, instead of drizzling the olive oil on top of the bread, I’ll brush it the next time for more of an even coating and even browning. As it was, the top of my bread had zigzags left by the olive oil. That said, the flavor definitely brought me back to Cinque Terre. Hmmm. 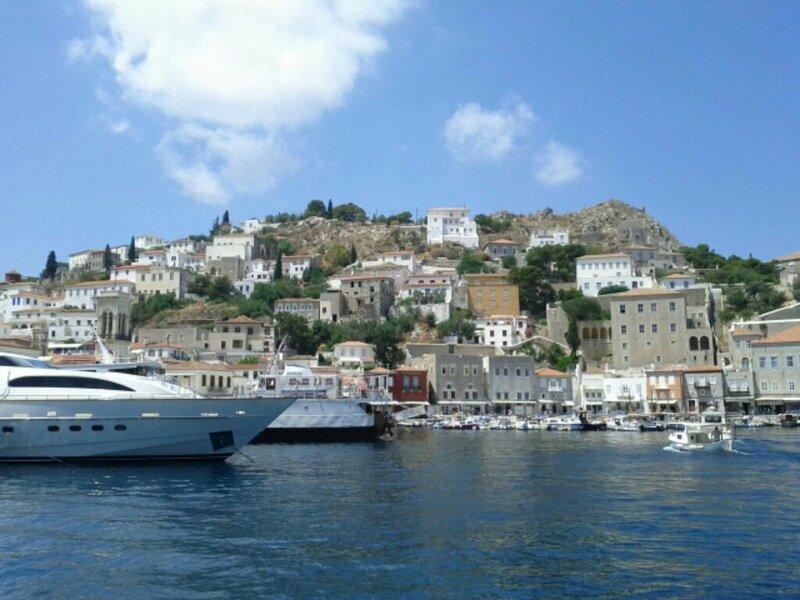 Time to get planning summer vacation. Bachelorhood gives me the opportunity to try cooking some foods that I wouldn’t get the chance to with the whole family in town. The kids and Mrs. NH are in Texas and I figure they’re eating well so why shouldn’t I? So when I saw a kilo of pork belly at the Tesco Express last week, I grabbed it. Pork belly is not something I’ve ever attempted to cook. I’ve eaten it several times out at restaurants and always loved it. It’s fatty, flavorful and probably isn’t very good for you – which makes it just a little more fun to eat, right? So after I had the belly in my possession, I had to get a recipe. I asked Scamp if he had a recipe – I thought this would be a slam dunk. He’s roasted, cured and smoked just about every mammal and fish known to Kansas and beyond and I figured pork belly would be an easy ask. Not so. So I went out searching for a recipe on the web. I found this one on Jules Food which is a less fussy, slight variation on a recipe from Jamie Oliver. It’s this simple: Season your belly with salt and pepper, put it on a bed of sliced onions, blast it for 30 minutes on 450, then lower oven to 350 for 2 hours. Drool, drool, drool. 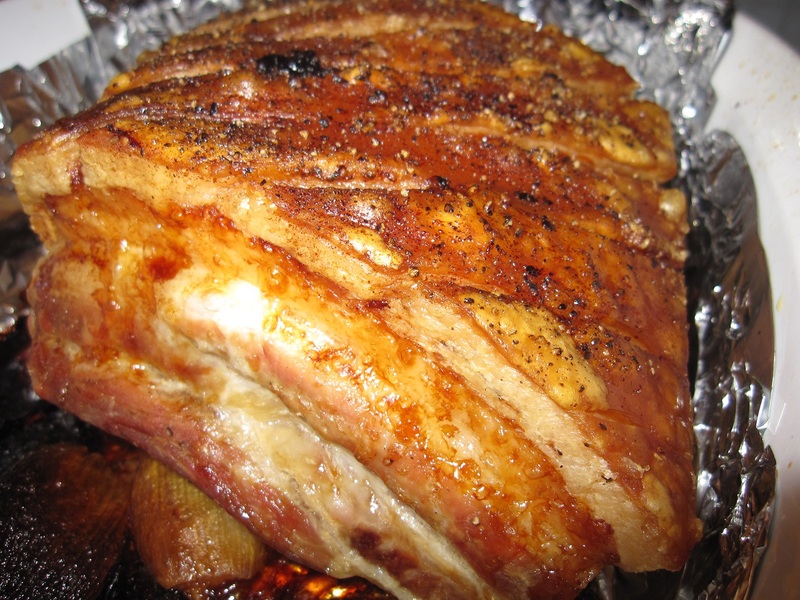 The belly came out moist and the skin was all “cracklings” in the best sense of the word. Unbeknownst to me, the belly I picked up actually had the very tips of rib bones in it and the flavor of the meat around the bones was the most delicious of all. 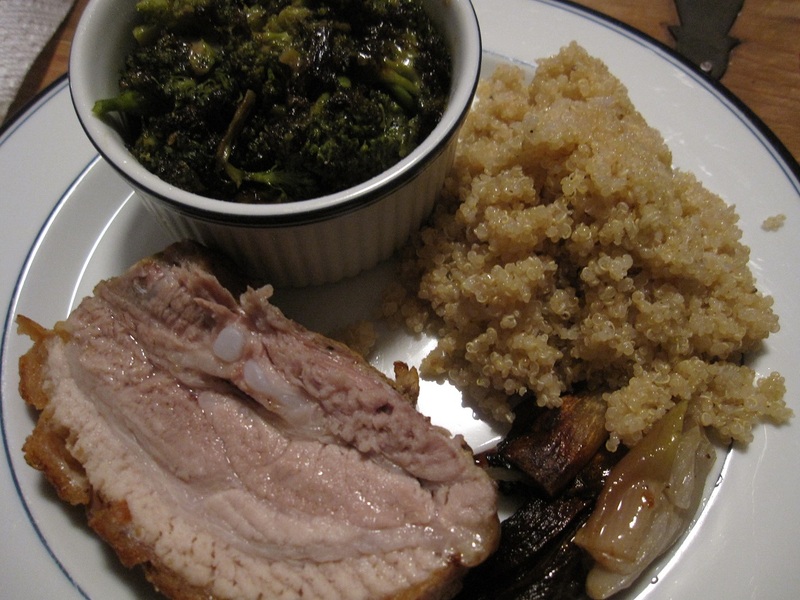 I plated it up alongside some Parmesan-roasted broccoli and olive oil quinoa and a glass of punchy Austrian Blauer Zweigelt. It was really, really delicious. However, those that are looking to try it should know that a flavorful red wine is recommended to cut through the richness of the meat. And oh, the meat. Fork tender and juicy without being oily. The added bonus at the bottom of the pan were the confitted onions that had cooked to sweet perfection. Little NH loves bacon and I told her about this recipe. She said she wanted me to save her some. Not a chance. 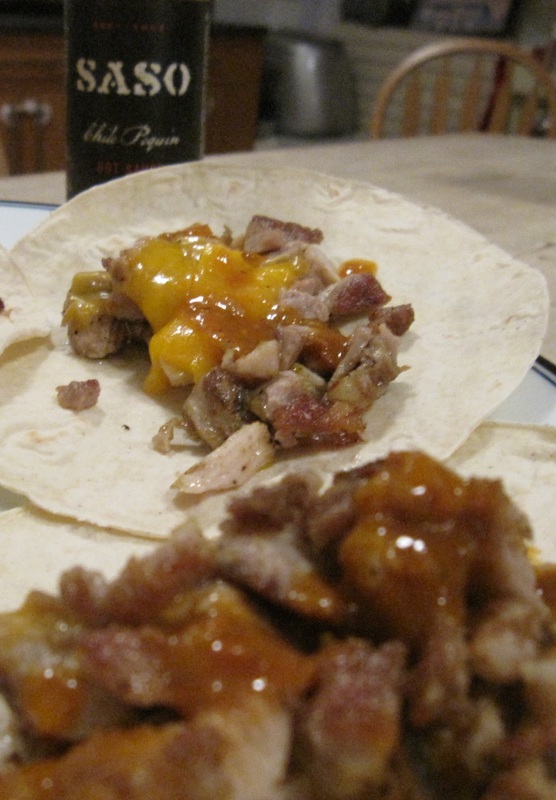 A couple of nights later I made pork belly tacos on corn tortillas with a generous dash of SaSo finishing sauce. No, Little NH won’t get a bite of this batch but if I ever run across a belly again, Katy bar the door! We didn’t have plans for Sunday. Mrs. NH was kind enough to brave freezing temperatures to go for a quick supermarket trip while the girls and I puttered around the house and watched vacation home movies on my newly reconditioned Windows Media Center. Of course in the Not Hemingway household, a day without plans usually leads to cooking of some sort. This Sunday was no exception. Over the course of the afternoon we churned out a hearty Italian vegetable soup, chicken salad, homemade soft sandwich buns and cheesesteak sandwiches. We’ve made cheesesteaks before but have always been at the mercy of awful Czech supermarket rolls. Czech bread is an absolute abomination. The problem is, there is a wide selection of shapes and sizes of buns and rolls at the supermarkets but all taste pretty terrible. The sandwich buns are always awful, dried, grainy affairs. To add insult to injury, they have a picture of the American flag on the bag. Not cool, peeps. Not cool. 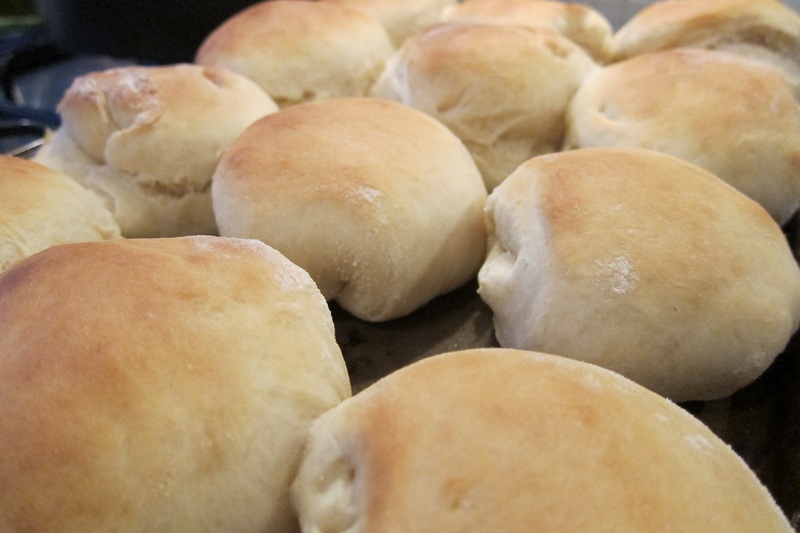 On Sunday I took matters into my own hands and made the sandwich buns that I had been threatening to make for years. I followed this recipe that I found online and was quite pleased with the results. The finished bun was firm and dense but fluffy – just firm enough to hold up to our gooey cheesesteaks and I can only imagine they would be a fine match to a juicy burger. For the cheesesteaks I halved and sliced two large onions and caramelized them over low heat. After they finished I set them aside and threw a little over a pound of super-thinly-sliced sirloin, trimmed of the majority of fat. I’ve been making these sandwiches ever since we moved here and have learned a few things along the way. There’s no need to freeze your beef to get thin slices – just make sure you knife is sharp. Also, get your pan as hot as it will go before throwing in your beef. As it hits the pan it gives off lots of liquid. If your pan is hot that evaporates and your beef gets a nice brown crust. If the beef is cooked slowly, it boils in its own juices and that ends up in tough and spongy meat. Not good. Last but not least, make your sandwiches like they do in Philly. Mrs. NH and I frequented Pat’s every chance we got and we always ordered our steaks “wit’ Wiz.” That’s with Cheese Whiz for any of the uninitiated. 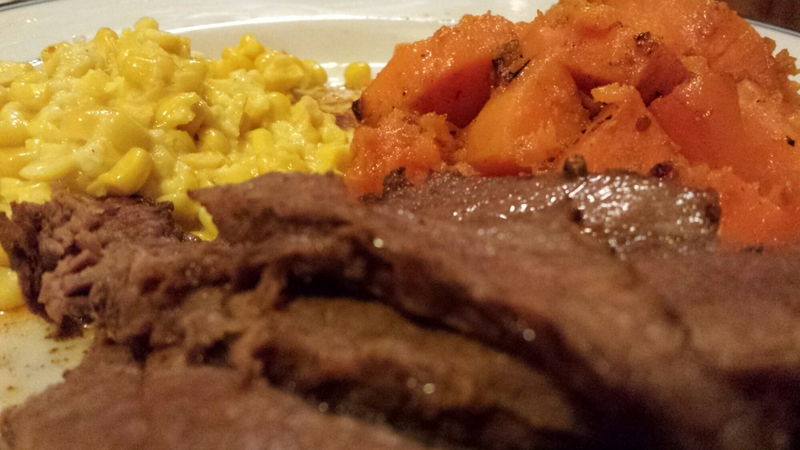 It’s an everyman twist on some real comfort food. Adding provolone just seems to high falutin’ now. Paired with the new buns, the steaks were out of this world. 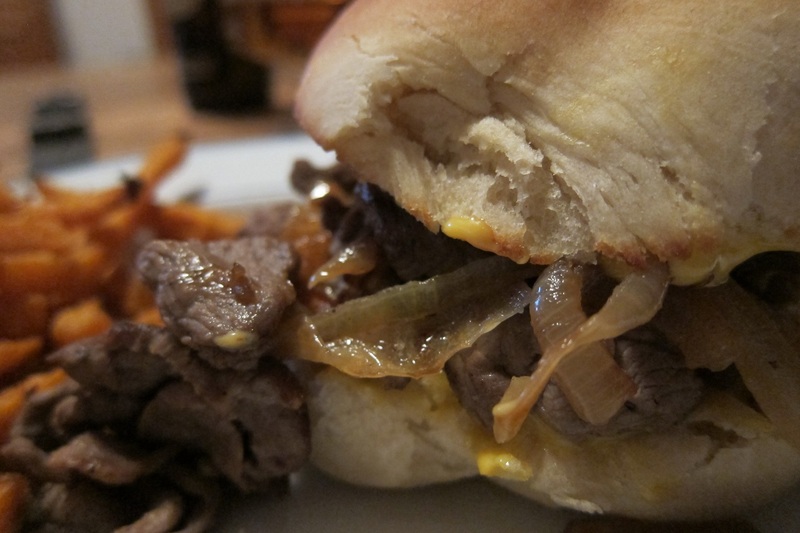 With no tough bun to contend with, I really appreciated the tenderness of the steak, the sweetness of the onions and the salty, tangy punch of the Whiz. We paired our sandwiches with some sweet potato fries and a couple bottles of Delirium Tremens. Now that’s a Sunday dinner. Thanks for the memories, Passyunk! As I sit in my office and fret about the fate of the freedom of information in far flung countries, my wife agonizes, yes, agonizes about cakes for the birthdays of my two little girls. To her, a good crumb coat is just as important as stemming nuclear proliferation. The search for black food coloring in Prague triggered a sort of culinary Amber Alert with all of my Czech associates. The lady takes her cakes seriously. And it shows. Here is the first one she did while home with the girls in Texas to celebrate Little NH1’s fifth birthday. For those of you who don’t know, this is Belle, from Disney’s Beauty and the Beast. I don’t think Little NH 1 has even bothered to sit through that movie. Nevertheless, Belle stuff is all over my two bedroom apartment. Books by the toilet (er, potty), stickers in drawers, costumes and shoes in corners. So I guess it was fitting that this cake was featured for Little NH1’s 5th. 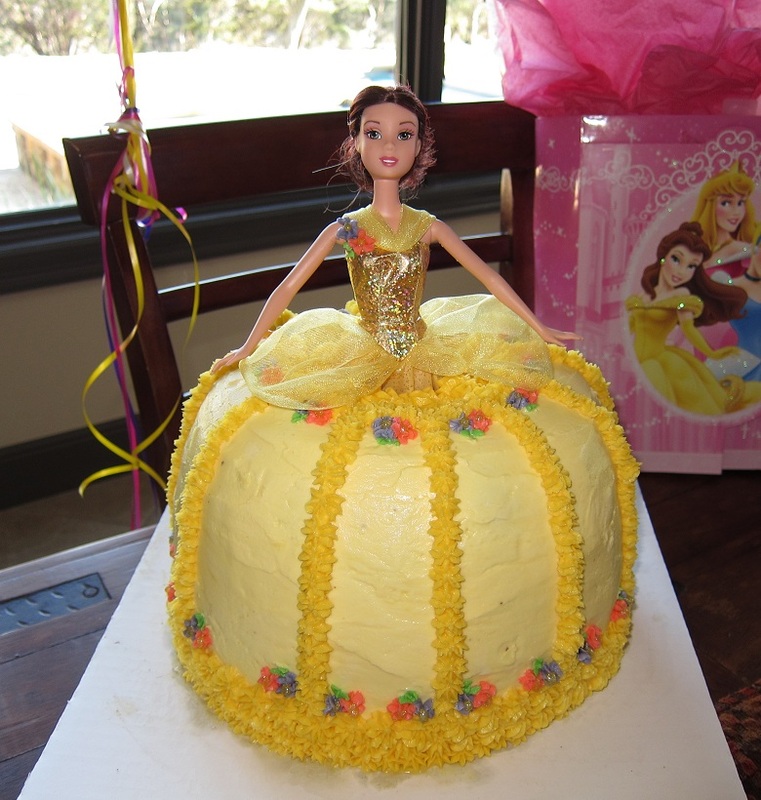 I didn’t get to eat the Belle cake but all who were in attendance proclaimed that it tasted as good as it looked. 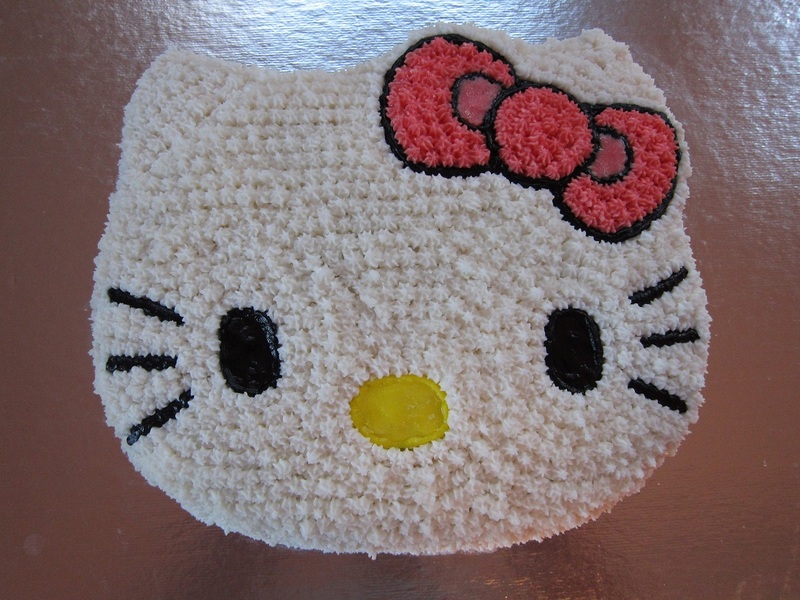 Using her freshly honed cake decorating skills, Mrs. NH traveled across the Atlantic, Hello Kitty cake pan in hand. She decided she was going to go simple for Little NH1’s family birthday celebration in Prague. I stopped off at the local pizza joint and got some margherita pizzas to go. When I got home, I found the Hello Kitty cake below. The frosting was from scratch. Butter cream, I think. I can only imagine how long piping that thing took. Kind of made my pizza contribution look mediocre. I’m getting used to that. Think they are, too. Yes, she’s a heckuva mom. Not a bad baker, either. 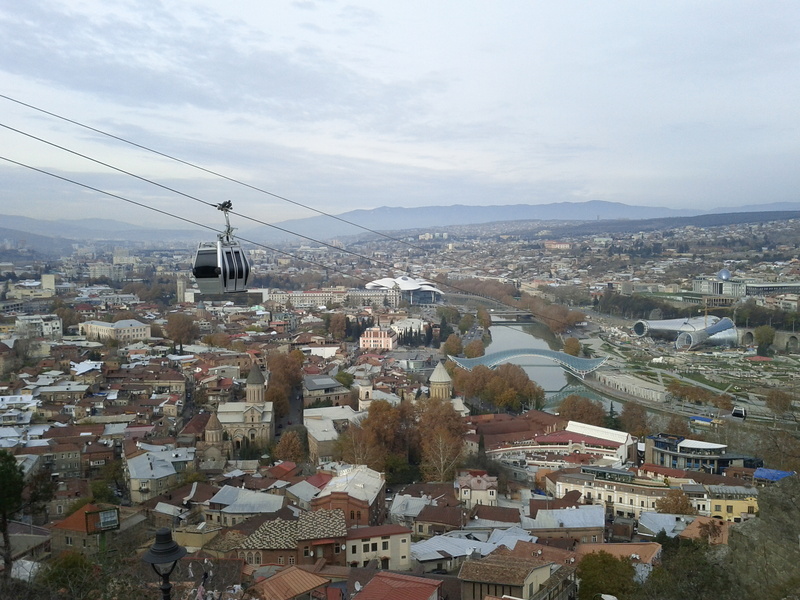 Last Saturday morning was sunny and beautiful. We decided to take advantage of the weather and walk down to the Dejvice farmer’s market and see if the selection of food on offer had improved since Mrs. NH’s visit a year or so ago. Suffice to say, it has. 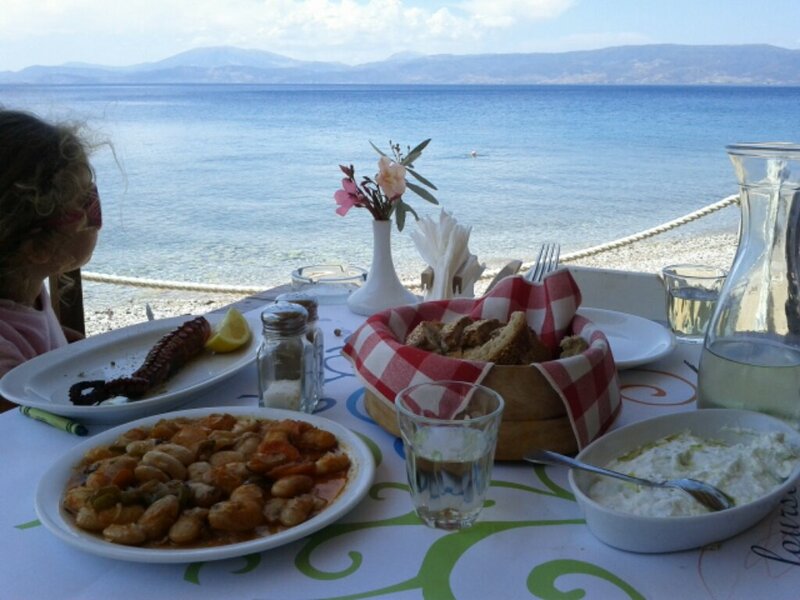 There were beautiful spring flowers, an assortment of international meats and cheeses, seafood, and even fresh pasta. In one booth there was a friendly Czech/Spanish couple selling their olive oil from Andalusia. Anyone who reads this blog knows that I’m a sucker for anything from Spain. I tried their olives and both their filtered and unfiltered oils and fell in love. We bought a bottle and proceeded to buy some fresh bread at the store and dip to our hearts content. We have about 5 bottles of olive oil from all over Europe in our kitchen and this one certainly stands out as one of the tastiest. It’s rich and green in flavor with just a hint on spice on the finish. It’s nice to have a good olive oil that we don’t have to ration. If we run out we can always walk back to get more next weekend! This was an improvisation about a month ago and it’s so easy and good we ended up doing it again for Easter. Mrs. NH and I were both sick and this was a nice mix between gourmet and easy. 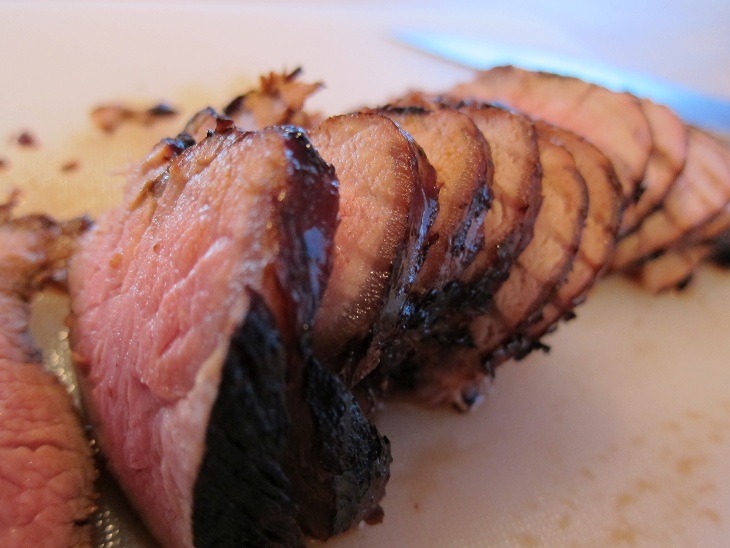 I marinated the tenderloin in a Ziploc with dark soy, olive oil, lime juice and honey for about 3 hours before grilling it. The outside had just the right amount of crispiness from the sugar in the marinade and inside it was fork tender. Served alongside some brown rice and fresh green beans, it was a meal packed with flavor. Oh, the life of a bachelor. Canned food. Of course, if you’re this bachelor, it’s duck confit from a can. Don’t cry for me, Argentina. Er, Prague. 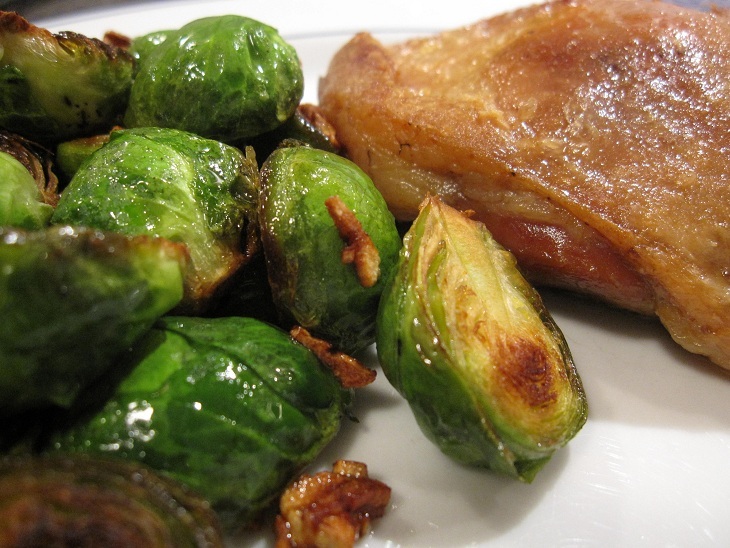 Yep, duck confit and these sprouts that I have told you about before were dinner on Sunday night. Crackly skin, puffy almost candied chunks of garlic and a good Pinot made the night quite enjoyable. It almost made it easy to forget the fact that my family was just minutes away from some of the best BBQ in the world. Almost.